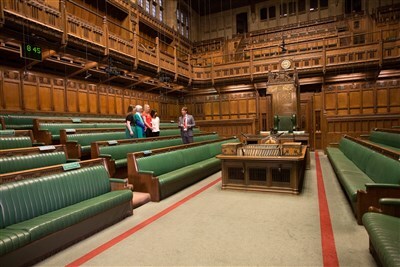 Audio tours of the Houses of Parliament offer a unique combination of one thousand years of history, modern day politics, and stunning art and architecture. Most of what is seen on the tour was built in the mid 19th Century following a devastating fire in 1834, but the route also incorporates Westminster Hall, begun in 1097 by William Rufus, son of William the Conqueror. The tours start by following the route taken by The Queen at the State Opening of Parliament; from The Queens Robing Room, through the Royal Gallery and Princes Chamber, into the majestic Lords Chamber. Tours then move on through Central Lobby, Members Lobby and one of the voting lobbies before entering the Commons Chamber, scene of many lively debates. Passing through St Stephens Hall, the tours end in 900 year old Westminster Hall, a place where many historic trials have taken place and where Nelson Mandela and Barack Obama have addressed Parliament in more recent years. Please note you will be given an audio headset to use at your own pace around the Houses of Parliament, there will not be a personal guide.